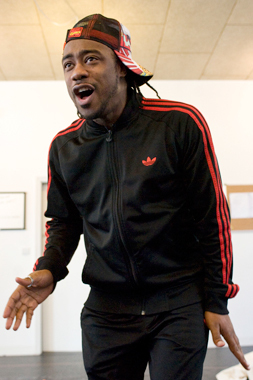 Choice FM DJ, MTV presenter, comedian, actor, choreographer, the list goes on but now Kat B stars as the lead in Talawa Theatre's Anansi and the Magic Mirror at Hackney Empire, Sophia Jackson caught up with him. I don't want to jinx it but it's been lots of fun and everyone's working really well together. We've got an amazing director (Paul J Medford) and although I've worked with the best, Paul's amazing, so down to earth. He works with your weaknesses as opposed to just your strengths. If you think you can't do something he'll say yes you can but you just have to do it like this. We've been in rehearsals for a week, so far and on the first day we just got through the play it was very nerve wracking but because we've had so much fun, laughter is medicine; we've absorbed more of the script than we thought. It's very wordy and in depth in parts and yesterday we did lots of changes but we're getting there. Sophie (Benjamin) is fresh out of drama school and is the only new person, the rest of us are good friends (Marcus Powell, Darren Hart, Susan Lawson Reynolds and Tameka Empson) so this play will go down in history because we get to see each other all the time. It will be hard to get all these actors together again. It's an awesome show and it shouldn't stop here, we need to go on tour with it. We're in rehearsals from 10am to 6pm, it's very different singing and dancing all day to sitting at your desk, we do half an hour cardio, some Jane Fonda stuff before we start rehearsals, Paul really works us so I'm going to looksexy and trim by the end of the show. Are you enjoying playing the lead? I don't' see myself as the lead I might have the title role but everyone has the same amount of stuff to do, luckily I've worked with a few of the guys before so it's almost like a working holiday and we're like one big happy family. With any Anansi story everyone is on the same par unless he's the only one in the story. It's my first time as Anansi, so this is my audition so if I tear it up hopefully they (Talawa) will want me back. They wanted me to do it last year but I couldn't as I was doing another show but this year they worked around my plans. Have you been reading lots of Anansi books as part of your research? Well Anansi, like the other characters like bredda monkey, bredda lion and bredda snake, have animal characteristics. For example, without spoiling it, if it was bredda ostrich he'd be a nervous person. Everyone knows that Anansi's a trickster and in this story, Anansi gets his comeuppance. My primary school teacher used to read us Anansi stories and I have a dog and a menagerie at home with creepy crawlies, geckos, lizards, shrimp and fish in a massive marine set up in my house. How familiar were you with Anansi stories? They're stories are about morals that your mum, dad or grandmother might tell you when you were growing up, so you would learn and say 'oh yeah'. Children are intelligent so you have to 'skank' them a little and Anansi will con anyone to get what he wants. In this production, the moral of the story is about working as a team and believing that we can get anything done, no matter how hard you think it is as an individual. Another moral it tells is about not troubling trouble, unless trouble, troubles you. 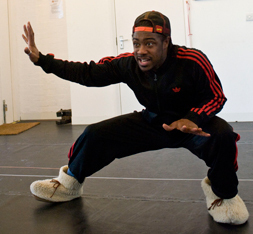 You have worked closely with Tameka Empson in the past, do you distract each other during rehearsals? Yes, we distract each other but we've been quite tame on this one but it might come more once we've got all the lines. During rehearsals for Anansi, there've been lots of moments where we've been crying with laughter on stage and the director's is just sitting there with his arms crossed and shaking his head and then he'll rock a little bit and say 'right, that was interesting'. Do you and your fellow cast members give each other tips? We give advice to each other in a certain way, you have to know tact and know when to give advice, you don't want to upset someone after eight hours of rehearsals and their already tired. I'm volatile and if you challenge me I'll fight you even if I lose I'm going in all guns blazing so we tread carefully around each other. 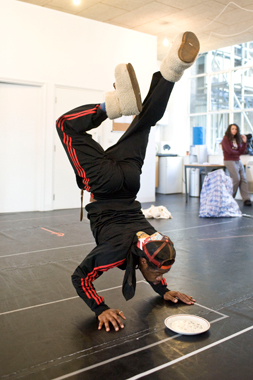 Why should people come and see Anansi and the Magic Mirror? If you're a child, come out and see a great show. If you like to laugh, have your child come and watch theatre, and get back into theatre. It's an ideal way for young people and children to get into theatre and learn through fun and a get a piece of history. If you're an adult then come and relive your childhood, anyone that knows the Kat and Tameka show (back again in June), if we say, come then you know that no matter what age you are, you'll take a little message home. It might not lick you the first day or second day but it will. What else have you got planned for 2009? When this is finished I'll get a short break. All summer I was touring doing Sweet 16 stuff for MTV and then panto. I'll be working with Collin Brown, Caribbean Master chef, as an apprentice for him in Canary Wharf. I like cooking when I'm not working and have got plenty of ideas. I think if you can learn it, then do. A lot of people prefer to be lemmings and are stuck in an office job rather than finding their passion, I surround myself by doing things that I love. What I say to young black people is that you should treat your life as a brand and know what you're doing by planning. Susie McKenna (Hackney Empire, director) had already casted for Aladdin before Mother Goose had finished last year at Hackney Empire. Keep working and planting your seeds. I don't do choreography anymore but sometimes do guest workshops or people might ask me to do comedy, or something for MTV or Choice. You have to keep growing bit by bit but don't bite the hand that feeds you. Click here for a preview and to meet Anansi.